With eternal patience, he sorts out the rat’s nest given him by his son. We hold our thumbs down hard on the spool as we throw line and lure to the sky. Two sand bars away, the splash… be ready. Tighten the line for a two-hook strike. Looking for whiting or trout or redfish to break the surface, pulling line from a reluctant reel. We wait. Dad fiddles, sweating in the surf. He would surely be complaining if not vacationing in his favorite place in the world. Take two steps back to lose the slack without reeling. With one finger on the line, we wait. 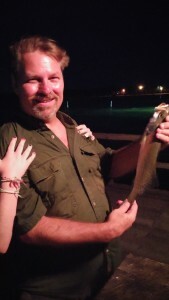 A lesson in patience, feel the current dragging sinker and bait across the ribbed sandy floor of the Gulf. Resist the urge to set the hook. That’s not a fish. Dad has rehearsed this scenario a thousand times. The steady waves try to knock you off your feet; take your focus away. Just when you’re thinking about something back at home- school, girls, lunch…. Dad’s yelling encouragement from his shallow spot where, until now, he’s been head-down in a tangled mess. Finally, after all those months of waiting for this trip, hours of driving down, all the time to rig everything up, cross the hot sand…there they are. Two five-pound-Whiting…shining in the sun. I never realized then, so many years ago, how much effort Dad put into those trips, working so many months, paying all the bills, going through the motions day after day, so… that for two solid weeks… he could stand in the surf, waves pounding, waiting, waiting, only to catch a fish. Was it the fish? Or, was it what the fish represented? How could a boy from Lubbock, Texas be so engulfed by salt water fishing? Was it given by his mother, Margaret Bradley, who set the Texas State record for Black Drum decades ago? Where did she get the salt-water bug? I should have asked those questions then. I should have fished with my grandmother Margaret then. I have a collection of open-faced reels that she and Dad used. I don’t use them now for fear I will lose or destroy them. Should I place them in a box to be mounted on the wall? Should I use them now? Margaret would surely approve. Maybe my son or daughter could set a new state record with one of her reels. I think that’s exactly what I will do. 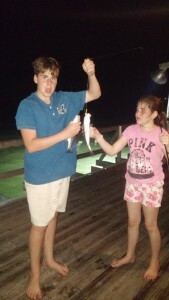 I’ve recently had the opportunity to share my salt-water fascination with my 11-year-old daughter and 15-year-old son. It’s a simple thing, really, but, as I write this, I realize why it is so emotional. Our children look up to us, idolize us, want to grow up to be like us. We should let them; hold that dream in front of them. We know we are flawed. We know we all fall short. Let them imagine, for a moment, that we are the perfection they see through their eyes. Don’t poison that well; not just yet. We try sometimes, in vain, to protect them from reality and the pain of falling short. Instead, we should only teach them to reach. Failure will surely come. Persevere through the failures in life for that one moment; that one moment when it all comes together. Every time that line goes tight, just before the strike, I focus on the possibilities. I never consider all those casts of the past that gained nothing. I clear my mind. Everything is as it should be. 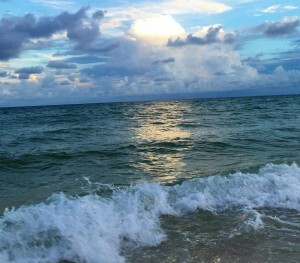 I thank God for the opportunity to share this salt-water world with my children. Two Trout – One Rig! Dallas to Houston to La Grange Owner, Discount Family Fun. 1 Response to Fishing with Dad.